On 23 March 2015, the 5th advanced courses for newly-consecrated bishops of the Russian Orthodox Church began with the blessing of His Holiness Patriarch Kirill of Moscow and All Russia. The courses, organized by Ss Cyril and Methodius Theological Institute of Postgraduate Studies, are being held at the Department for External Church Relations of the Moscow Patriarchate and the Russian Academy of National Economy and Public Administration. At the DECR Large Hall, Metropolitan Hilarion of Volokolamsk, chairman of the Department for External Church Relations, rector of Ss Cyril and Methodius Theological Institute of Postgraduate Studies, greeted the bishops who had arrived in Moscow from different Russian regions. In his address, Metropolitan Hilarion reminded all those present the words of His Holiness Patriarch Kirill who had said that it was a matter of great importance for bishops to advance in education and acquire new skills. The courses programme prepared by Ss Cyril and Methodius Theological Institute of Postgraduate Studies is aimed at supporting new hierarchs in carrying their cross of establishing new dioceses. During the courses, over thirty lecturers will speak to the bishops, Metropolitan Hilarion noted. 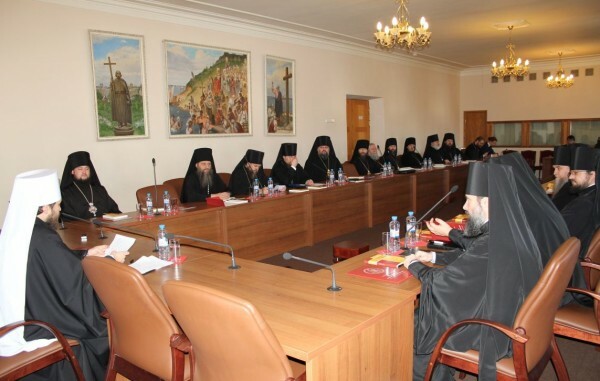 “Among the items of the courses agenda is cooperation with the Chancellery of the Moscow Patriarchate, coverage of the Church-wide and diocesan activities in the mass media of a region, arrangement of His Holiness Patriarch’s visits to dioceses, principles of records management, financial statements of church organization, legal consulting, ecclesial legal proceedings, relationships with a metropolitan, clergy and education departments, and other issues,” the DECR chairman said.